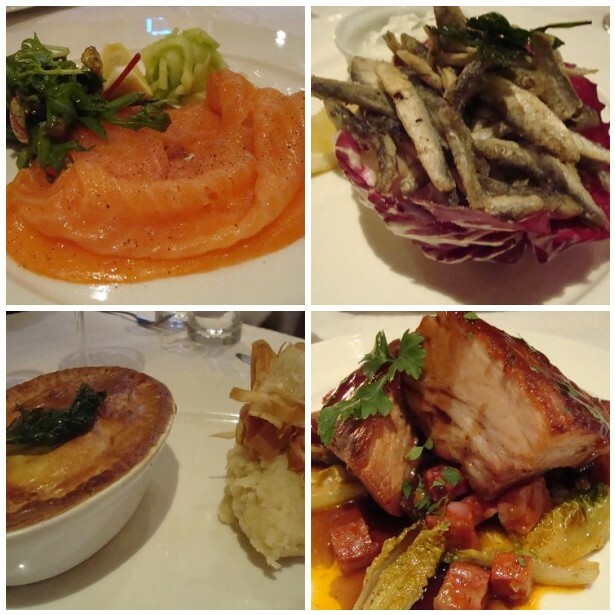 A couple of weeks ago, Stephen and I met some friends for dinner in Sloane Square which, in my experience, is rather lacking in decent places to eat. Luckily, I had done my research in advance and was armed with a recommendation for The Enterprise which describes itself as “charming and homely” with a menu serving modern, British food. We arrived just before 7 and the small bar area was already full, the restaurant wasn’t far off it either. I was slightly concerned that the dining area was rather too formal for a catch-up with friends but they all assured me they were happy to stay and we were shown to a table by the kitchen. Providing there is decent ventilation so my clothes don’t become too smelly, this is my favourite place to sit. I’m naturally quite nosey but more than anythingh, I love to to watch the chefs preparing food and responding to the incoming tickets. There were five of us in total and we took pictures of all the food, sadly I’ve left it far too long between visiting and posting (as usual) and can’t remember what everyone ate or what they thought of it. Luckily, I can remember what Stephen and I ate so can tell you about that. I started with whitebait, it’s one of my subconscious rules: if whitebait is on the menu then I always have it. I have loved whitebait for as long as I can remember and am delighted that it appears on menus more frequently these days. This was a particularly good example, the fish were just the right size: plump and juicy and coated with exactly the right amount of batter; there was a decent cayenne hit too. Stephen ordered smoked salmon which came with capers and pickled cucumbers, a perfect combination. The fish was meaty and not too smoked, well balanced by the vinegary capers and cucumber. A slice of soft brown bread (while perhaps too retro for The Enterprise) would have been a welcome addition. To follow, Stephen ordered the game pie. I suspect he has a similar rule about pie as I do about whitebait, it’s certainly one of his favourites. He remarked that the pie was gamier in flavour than he expected but enjoyable nonetheless. I opted for the special of pork belly and chorizo, I didn’t really bother to check the menu once I’d seen it if I’m honest. With two of my favourite things on one plate, there was never going to be another option for me. The pork belly didn’t disappoinit; full of flavour and accompanied by a rich, deep jus, I couldn’t work out all the flavours in this though. Slightly disappointing was the lack of crackling, there was a little but it was heartbreaking to leave behind so much of the lovely skin that could so easily have been crunched up. And that’s where my memory deserts me; I know there was fish and chips (with those stupid, Jenga style chips that are becoming increasingly popular) and seabass with Meditteranean vegetables, I even have pictures of them, I just can’t remember what was said about them. Next time, I’ll make notes. I would definitely recommend the Enterprise if you are in the area. Slightly smarter than your average gastropub (which is reflected in the price) but the food was consistenly good and well thought-out. Subscribe to comments with RSS	or TrackBack to 'The Enterprise'. My sources tell me that there was a goat’s cheese soufflé which was simply wonderful. Aha! It looked like a souffle but I have no recollection of anyone ordering that, must have been because I was so engrossed in my whitebait.